To start your regimen you only need one product out of each category, in the beginning. Once you get started with your first 4 products, then you want to build on those products. The CoilyQueens Regimen recommends having, 3 of each recommended product. This means 3 cleansers, 3 conditioners, 3 leave in conditioners and 3 different types of oils you love. You do not want, to depend on one brand of cleanser or conditioner. To often your favorite conditioner will stop working as well as it did in the beginning. Sometimes companies change formulas. You can also develop an allergy towards a product that was okay in the beginning. So if you have more than one cleanser and conditioner, that works for you. You do not have to worry about being caught without having a product that works. Before you shop remember these tips. 2. Get in the habit of reading the ingredients before you buy. 3. Starting out purchase the same brand of cleansers and conditioners. 4. Shop with companies who stand behind their brands. Keep your receipt so you can return it, if after one use it does not meet your liking. 6. Spend your money on good quality oils, from the health food store, grocery store. Be sure they are unrefined or cold pressed. Following these suggestions will help you build a good portion of your product regimen. 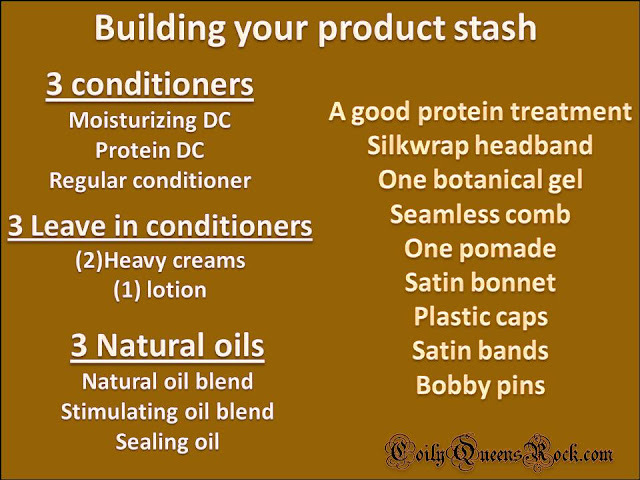 Remember that a successful hair journey covers 3 areas: Techniques, mindset and products. This article has helped you cover the products part of your hair regimen. Now work on your techniques and mindset about your hair.